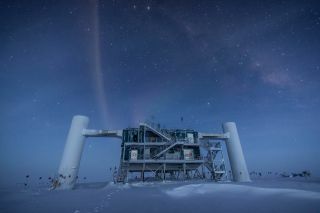 The IceCube Laboratory at the Amundsen-Scott South Pole Station in Antarctica is the world's largest neutrino detector. Its computers collect raw data on neutrino activity from sensors in the ice that look for light emitted when neutrinos strike. In this artist's illustration, based on a real image of the IceCube lab at the South Pole, a distant source emits neutrinos that are detected below the ice by IceCube sensors. A digital optical module (DOM) being lowered into the hole of an IceCube Neutrino Observatory string at the Amundsen-Scott South Pole Station in Antarctica. The IceCube detector consists of 86 strings of DOMs -- which look for light when neutrinos strike the ice – vertically spaced about 17 meters apart. In this illustration, a neutrino has interacted with a molecule of ice, producing a secondary particle—a muon—that moves at relativistic speed in the ice, leaving a trace of blue light behind it. This is the high-energy neutrino detected by IceCube on Sept. 22, 2017. The display shows a muon, created by the interaction of a neutrino with the ice very close to IceCube, which leaves a track of light while crossing the detector. The light collected by each sensor is shown with a colored sphere. The color gradient, from red to green/blue, shows the time sequence. NASA's Fermi Gamma-ray Space Telescope (top left) helped identify a monster black hole in a far-off galaxy as the source of a high-energy neutrino seen by the IceCube Neutrino Observatory (sensor strings, bottom). An artist's illustration of a blazar like the one recently found to be accelerating neutrinos and cosmic rays to tremendous speeds. The supermassive black hole at the center of the accretion disk sends a narrow high-energy jet of matter into space, perpendicular to the disk. Blazars are active galaxies with one of their powerful jets of material pointed at Earth. In this artist's illustration, a blazar is releasing neutrinos and gamma rays, which can be detected by the IceCube Neutrino Observatory as well as earthbound and space telescopes.